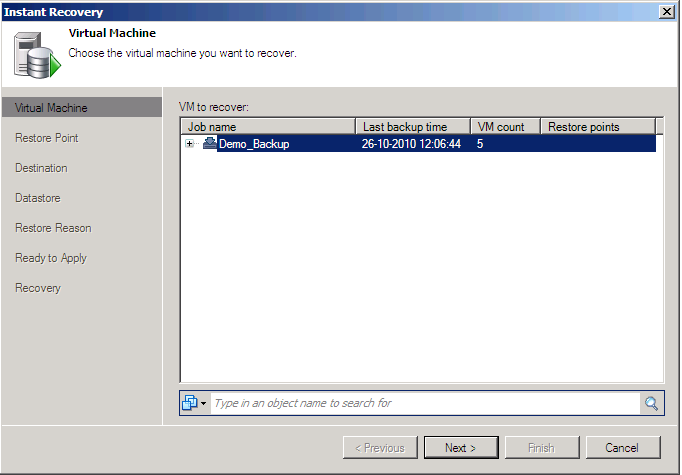 With Veeam Backup & Replication, you can immediately recover a VM from a created backup file. 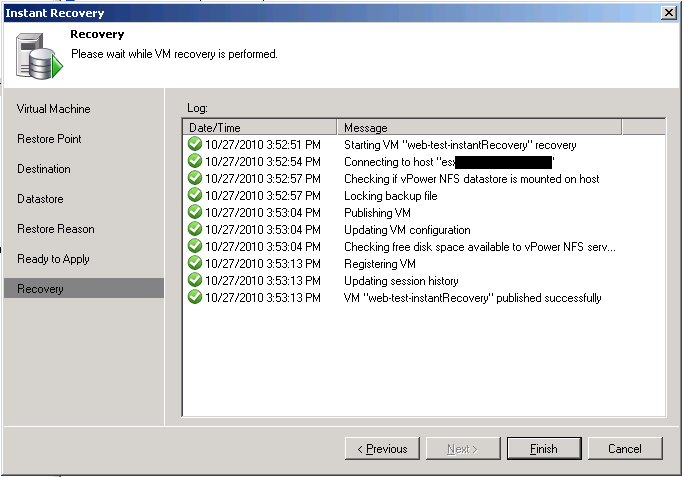 Instant VM recovery accelerates VM restore, allowing you to improve recovery time objectives and decrease downtime of production VMs. 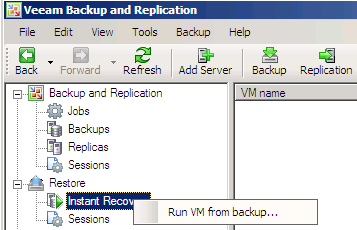 When performing instant recovery, Veeam Backup & Replication creates an independent temporary copy of a VM in your VMware environment and immediately starts it (if necessary). You can then move this copy to your production storage using Storage vMotion and cold migration to finalize recovery, or alternatively, replicate a restored VM with Veeam Backup & Replication and then fail over to the created replica during the next maintenance window. You can also use a recovered VM for testing purposes to make sure VM guest OS and applications are functioning properly. Similar to the SureBackup recovery verification technology, instant VM recovery does not require you to extract a VM from a backup and move it across datacenter — it mounts a VM directly from a compressed backup file on a selected ESX host. The archived image of a VM remains in a read-only state to avoid unexpected modifications. 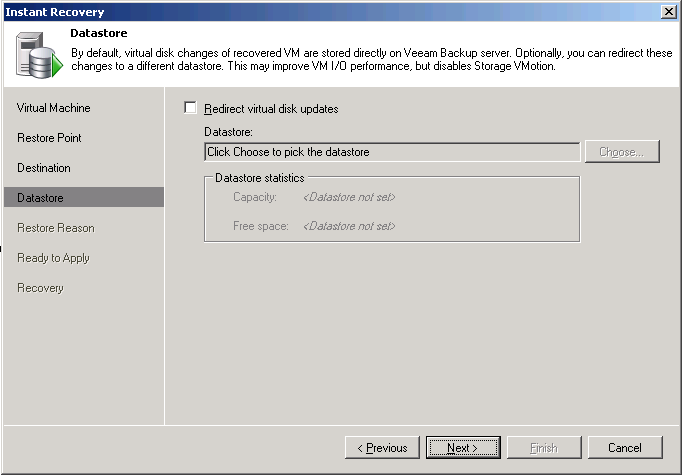 All changes to a virtual disk that take place while a VM is running are logged to an auxiliary file on the Veeam Backup server or any datastore you select. These changes are discarded as soon as a restored VM is removed. Go through the rest of the Wizard and select the destination vsphere host, datastore and resourcepool. When you finished the setup, just wait until the job is ready. Hmm.. Let’s start some basic storage troubleshooting. So the vSphere host cannot vmkping the Veeam server. 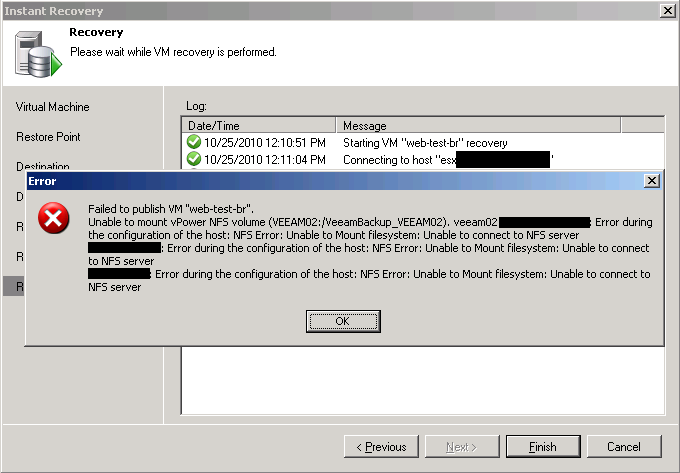 This means the vmkernel network is unable to reach the Veeam server. To solve this issue, I added an extra VMKernel network with an IP address in the same subnet of the Veeam server. Now I was able to vmkping to the Veeam Server. So I started the Instant Recovery wizard again. I didn’t enable the Redirect virtual disk updates option. If you select this option, you’re not able to perform a Storage vMotion. After finishing the wizard, the recovery will start and the vPower NFS share is mounted successfully. The VM was back online in less then 30 seconds. That’s amazing right! Conclusion: Be sure your network setup is ready before you start to deploy Veeam Backup. Be sure the Veeam Backup server is on the same network like the VMkernel network on the vSphere hosts or add a new VMkernel network to be sure Instant Recovery works as expected. This entry was posted in Veeam and tagged Backup 5.0 vPower NFS, vmkernel, vSphere on October 25, 2010 by afokkema. Awesome tip! Exactly the same problem I had. This is going down the right road, however, I am able to ping from Veeam to Host, Host to Veeam, and VMKPing from Host to Veeam and I am still receiving that error… I’m sure it is a networking issues, but I just can’t put my finger on what. I am in the same boat, can do all three pings but still get the error. Does anyone have any more ideas on this problem? Same here. The Veeam server is multi-homed. One network interface in the LAN, another interface in the Management LAN. ESXi is configured with a Management Network in the managment LAN aswell with a VMKernel port (vMotion enabled) in the Management LAN. I can ping and vmkping the veeam server by name and by ip. I van ping the ESXi server from the Veeam server. I tried to disable the LAN interface of the veeam server giving it just one interface, but still nothing!